Do you have what it takes to become the dumpling master? One of the defining pillars of Chinese cuisine, the ultimate Asian comfort food, and just plain #nom. Frankly, I could go on forever listing the myriad reasons why dumplings should rank at the very top of every respectable food lover’s list of must-eats. Given the sheer number of possible fillings, ranging from vegetarian to every possible kind of meat and seafood and the way of preparation – fried, steamed, soup dumplings – there is a big enough variety to choose from to please even the most refined of palates. If you love dumplings as much as we do, chances are you already stumbled upon our great dumplings recipe and our dumpling how to. You did? You aced it? Good work! Since you’ve already mastered the basics, here are three folding techniques that will take your dumplings to the next level. 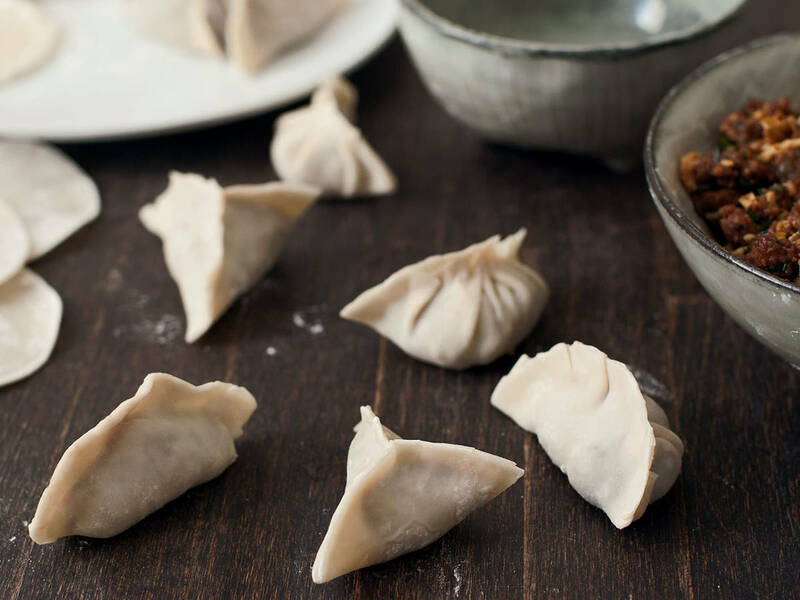 To the novice, pulling off the perfect dumpling can seem like an intimidating feat. To ease you in we’ll start with a simple one. Place a teaspoon of filling in the center of your wrapper and bring it to a taco shape. Pinch one end of the wrapper to seal the dumpling until about one third to the middle. Using your index finger, push the opposite end towards the center until it meets in the triangle shape. Pinch the seams of your dumpling to make sure it’s properly sealed. Start from the same taco formation like you did with triangle fold. Now, use your thumb, index and middle finger to make a “W” shape at one end and press it together to seal it. Then pinch the folded dumpling wrapper together until you reach the hallway point of the seam. Repeat the entire process with the other end of the dumpling. The pleated fold is a bit tricky, but not impossible to pull off. It just might take you a few more tries to master it. But once you do, you can officially call yourself a dumpling master. Place a teaspoon of filling in the center of your wrapper and – once again – assume the taco formation. Lightly pinch both sides of your wrapper in the center point of the dumpling’s seam. While firmly holding the seam with your thumb and index finger, use your index and middle finger of your other hand to fold a small portion of the wrapper towards the center of the seam to create your first pleat. Be sure to only use one side of the wrapper to form the pleat. The other side should be smooth. Add more pleats, working away from the center seam. You should end up with three evenly spaced pleats on one side of your dumpling. Repeat the entire process on the other side using your other hand.